I date to 1780, and thanks to careful preservation efforts, I maintain my original character. Looking at me from the front, you’ll notice I have a symmetrical facade with wooden clapboards and durable cedar shake shingles. My standing steam metal roof is punctuated by a brick central chimney stack for a double-sided fireplace, which was integral to warming up my owners back in the day. 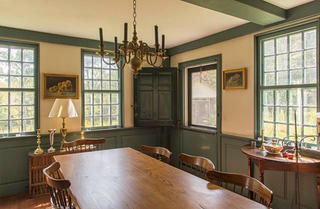 Inside I have plenty of historic features, like green-painted trim, chair rails, and 12-over-12 windows. Though the kitchen has modern equipment like a refrigerator and a large range with two ovens, its hand-hewn exposed timbers on the ceiling remind you of craftsmanship you don’t often find today. The firebox in the present-day living room is 5 feet deep, so you don’t need to worry about staying toasty in the winter. I’m the oldest building on the lot, but I’m not the only living space. 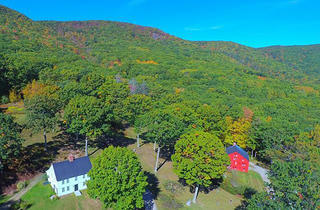 I share the 63 acres with a two-story barn that was built in 1880. 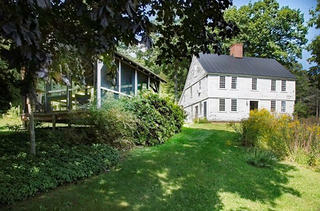 It was converted into a house with three bedrooms and a loft. Wide pinewood floors and floor-to-ceiling wood paneling on the walls make it a pleasantly rustic option for extended family or friends to stay when visiting. And with the views I offer—sloping mountains covered with beautiful, tall trees typical of the New England countryside, as well as a picturesque pond—I suspect you’ll have visitors quite often. You can raise the sash windows to let in the mountain breezes while you eat. I'm not too far from the Appalachian Trail, so you can easily enjoy more views like this.